The Permian Basin outlined in green covers parts of western Texas and southeastern New Mexico. SACROC oilfield, identified in red, resides on the northeastern edge of the Basin. 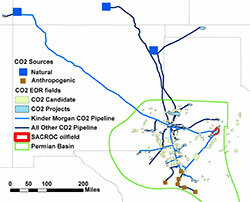 The map also identifies both natural and anthropogenic sources of CO2 as well as the CO2 pipelines in the region. Gulf Coast Carbon Center has been conducting a major research project in the Scurry Area Canyon Reef Operators (SACROC) oilfield near the eastern edge of the Permian Basin in Scurry County, Texas. The Department of Energy National Energy Technology Laboratory (DOE NETL) has provided $1M in funding for the project, which is one of three Southwest Regional Partnership for Carbon Sequestration (SWP) Phase II injection experiment sites. The Kinder Morgan Company owns and operates the SACROC oilfield and graciously serves as the major industrial partner in the project. Kinder Morgan has provided over $500,000 of in-kind matching funds for the research, none of which could have been accomplished without their generous cooperation and logistical support. Dr. Brian McPherson of the University of Utah has served as principal investigator for SWP. Dr. Reid Grigg of New Mexico Institute of Mining and Technology (NMT) has lead the effort to administer the project. Rebecca C. Smyth of the GCCC at the Bureau of Economic Geology is the site manager for SWP research at SACROC and Principle Investigator for GCCC SACROC groundwater research. Since 1972 over 175 million metric tons of carbon dioxide (CO2) have been injected into the SACROC oil field to enhance oil recovery (EOR). About half of the CO2 has been co-produced with oil and recycled (separated from the oil and re-injected for further EOR). The remaining volume is assumed to be sequestered at 6,000 to 7,000 ft below surface. For this reason, and because SACROC oilfield has the longest history of CO2 injection of any oilfield in the Permian Basin, the site is an excellent natural laboratory for studying subsurface storage of carbon dioxide. SACROC field experiments are being conducted on two scales. On a regional scale, research is focused on potential impacts to the shallow subsurface zones. GCCC and NMT researchers have sampled water wells as deep as 500 ft and measured CO2 soil zone concentrations within an ~800 mi2 area. Deep subsurface experiments are centered on an experimental site that is roughly 0.4 square miles in area with CO2 ;injection wells located at each corner and an oil production well in the center. All of these EOR wells are 6,000 to 7,000 feet in depth. Three observation wells are located within several hundred feet of CO2 injection wells. Researchers from BEG, DOE NETL, Los Alamos National Laboratory, Schlumberger Carbon Services, and the University of Pittsburgh are attempting to monitor movement of CO2 in the deep subsurface using geophysical techniques. Geophysics data were collected before and after CO2 injection that began in October 2008. The SWP project involves the four major areas of investigation listed below. GCCC is solely responsible for the groundwater studies. For more information on GCCC's results, please click the links below. Groundwater studies [PDF] conducted by GCCC. Please click on the links below for information about each of the topics. Our field-based study of shallow (<500 ft) groundwater overlying and within an ~1,000 mi2 area of SACROC shows no impacts to drinking water quality as a result of over 35 years of deep subsurface (6,000-7,000 ft) CO2 injection. Modeling of stable carbon isotopes (d13C) of injectate CO2 gas, DIC in shallow and deep groundwater, carbonate mineral matrix, and soil zone CO2 suggests that no significant injectate CO2 has been introduced to the shallow groundwater. Interpretation of groundwater flow regime, and concentrations of major ions and trace metals, indicate mixing of water types and water-rock interaction (i.e. dedolomitization) as major controls on groundwater geochemistry at SACROC. We think the popular assumption that carbonate parameters alone can be used as indicators of groundwater quality over a GS site is too simple, especially in complex hydrogeologic settings. We emphasize the importance of defining the regional groundwater system to (1) understand how it might react to introduction of CO2 and (2) identify the parameters best suited for monitoring over GS sites. Research is ongoing to define and group major geochemical aquifer systems and to assess the protocol that would be appropriate for each group. Aquifer sampling and analysis of site-specific conditions may be needed to understand how an aquifer system will react to CO2 and the parameters best-suited for monitoring at sequestration sites. Research is ongoing to define and group major geochemical aquifer systems and to assess the protocol that would be appropriate for each group. For a pdf of the complete report, please click here.